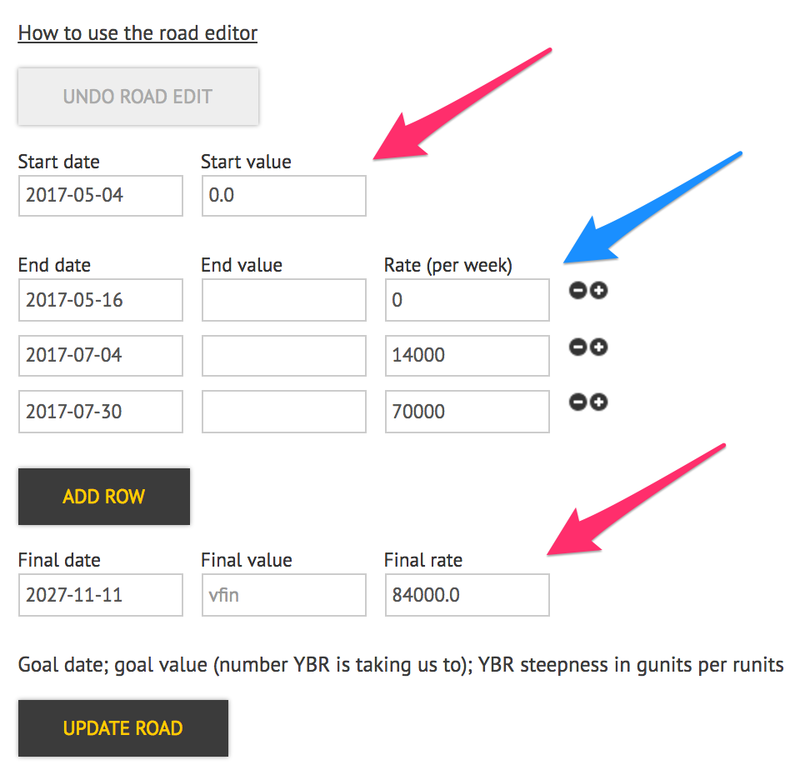 The Road Editor is a Bee Plus / Beemium feature that gives you an interface for making very specific changes to your road. While Take a Break lets you change the rate temporarily retroratchet lets you immediately jump the road, and you can use the road dial to change the rate more permanent, the Road Editor lets you do all of those things in one tool, and with a lot more precision! Because the road editor is how Beeminder goals are represented in the database, you can recreate any standard Beeminder features using it! A derailment, for example, is usually created by adding a date-rate segment followed by a date-value segment. It creates a row that preserves the shape of the road you were following until you derailed, then a second row that moves the road position to your current value. There might be a second date-rate if you don't have no-mercy on, so you get the 7 days off afterward. Take a break adds two date-rate segments: one that ends the day before your break to preserve the current shape of your road, and one that ends the final day of your break that uses your break rate instead. All of the above are changes to the present or future state of the goal. You can also use the road editor to change the past, if you're so inclined — you could smooth out previous rate changes, or remove breaks that weren't necessary, or deemphasize prior derailments if you caught up enough after-the-fact! With the Road Editor, you have complete control over how the road is drawn (as long as you don't make it easier in the next 7 days, that is). To make changes to existing rows, edit the values inside. If you need to add or remove a row, use the +/- buttons on the right-hand side, or the Add Row button to add a row directly to the bottom. Once you've made all your changes, click Update Road to submit! Unfortunately there's no "preview changes" functionality yet, so you can instantly derail your goal if you make a bad change. The Undo Road Edit button will restore your graph to its previous state, and you'll need to reply to the legitimacy check for support to cancel the charge. 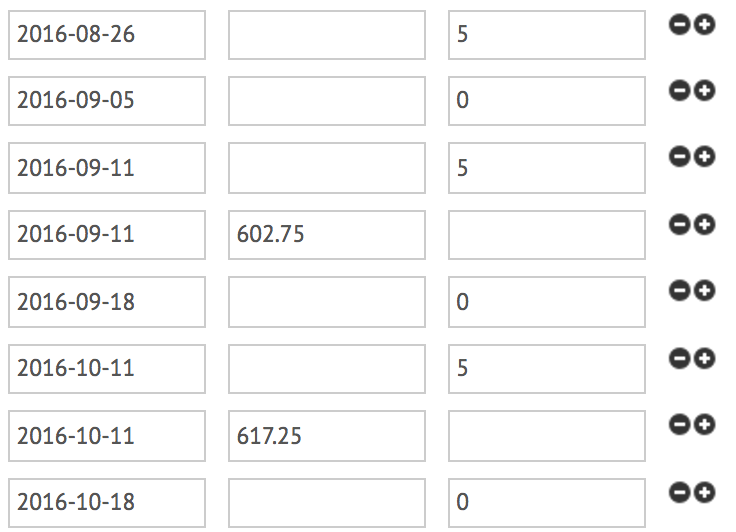 Illogical rate/value combinations (e.g. trying to lose weight at -1 pound per week until you reach 200, when your last datapoint was 196). Usually this is fixable by changing the rate from negative to positive, or vice versa — but make sure the final graph image looks reasonable, or you may end up committed to something you didn't intend! Still have questions, or want to read more? Check out the Road Editor's introduction blog post for more history and more ideas on how to use it, or contact support for more help!